Where history meets the adventure: The ideal island in Greece for sea kayaking and outdoor activities. Ithaca is one of the seven main islands of the Ionian Sea. It is located in a very strategic point which gives its visitors access to the other main islands as Kefalonia, Lefkas, Zante and some untouched remote islands as Atokos, Kastos and Kalamos. Ithaca is only 25km long from North to South and it has a long and important history. It is globally known as the home island of king Odysseus who invented the Trojan horse and ended the war at Troy, between the Greeks and the Trojans. He became a symbol of adventure travelling as he was searching for his way back home. The great ancient Greek poet Homer described the story of Odysseus in his famous poetries Iliad and Odyssey which have been read all around the world. Ithaca is an unspoiled island with 3000 permanent residents and its economy is based nowadays on quality – small scale tourism. 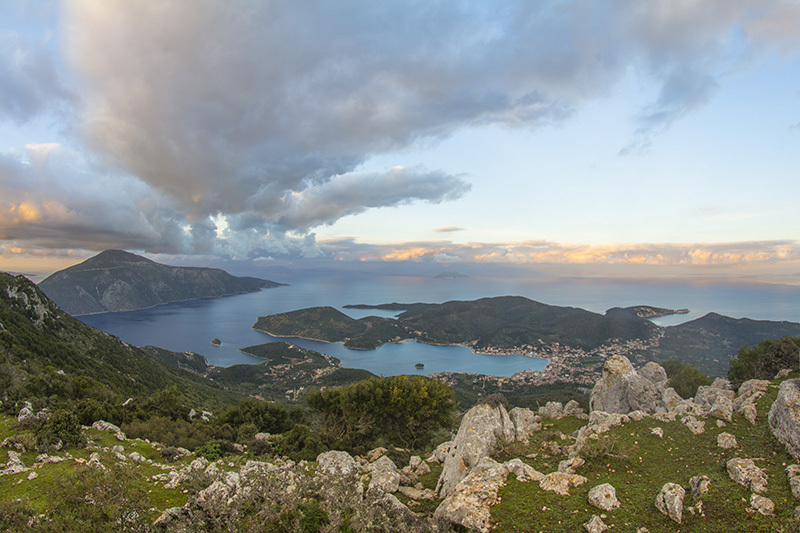 Ithaki (the Greek name) always welcomes its visitors and every traveler in a very unique way. 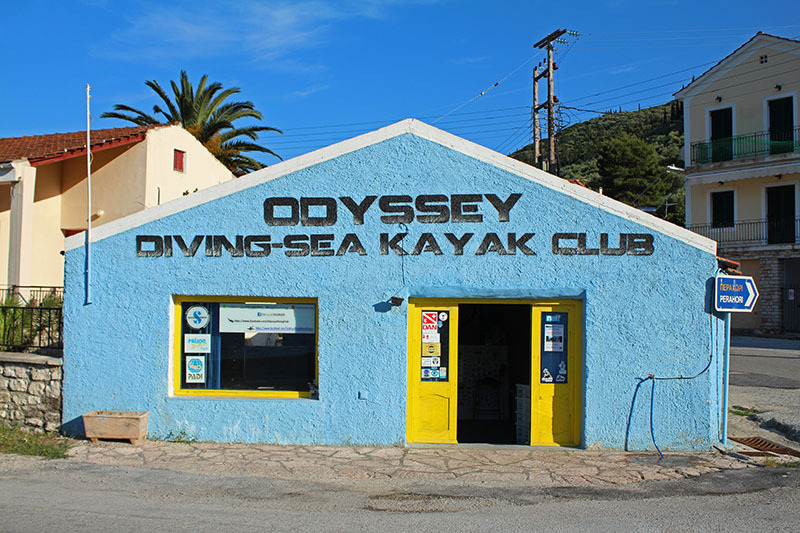 Odyssey Sea Kayak Club is located at the entrance of Vathy town at a quiet neighborhood right next to the sea. As you entering Vathy (coming from Piso Aetos harbor or from the North side of Ithaca) you will see our shop at the first crossroad when you reach the sea level. There is always plenty of space to park your car and visit us at the Odyssey Outdoor Activities shop. Ithaca’s main harbor (Vathy) is one of the biggest natural harbors in the world and it is a strategic point for sea kayaking. 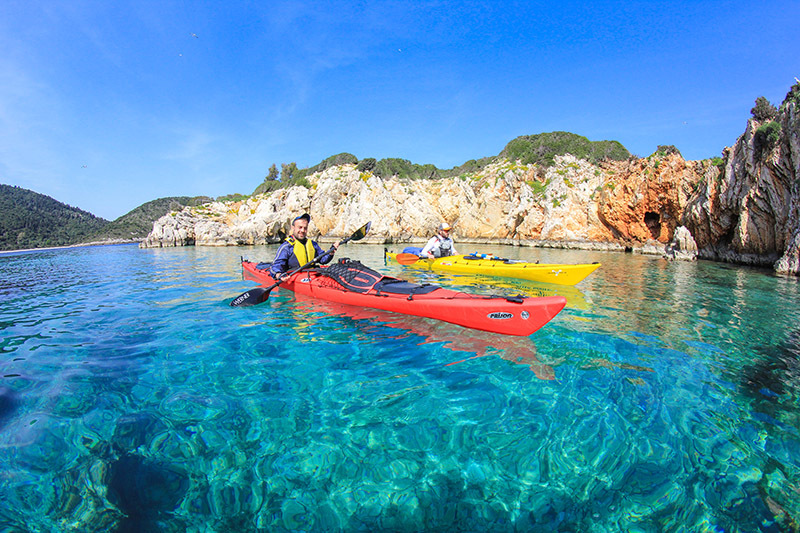 We are kayaking not only around Ithaca but also at many other islands of the Middle Ionian Sea such as Kefalonia, Lefkas, Atokos, Kastos, Kalamos, Meganisi and Arkoudi. 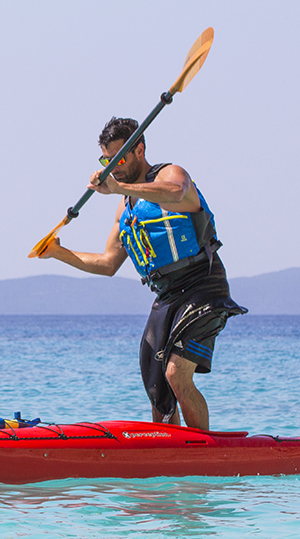 George is the founder, manager and main guide of Odyssey Sea Kayak Club in Ithaca, Greece. He has been sea kayaking since 2006 and he completed the sea kayaking BCU (British Canoe Union) 3 star award in 2011. 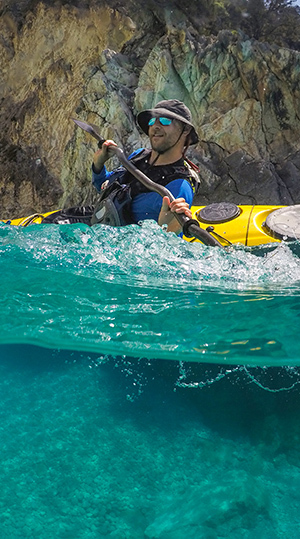 He has explored almost every islet of the central Ionian Sea with his sea kayak. In October-November 2014 he undertook one of the most complete and demanding sea kayak guiding courses worldwide, the 6-week “Coastal Guide” training at Sea kayaking Cornwall in Falmouth. He was trained in leadership, incident management, coaching, sea survival, navigation, remote emergency care, expedition skills, surfing and advanced techniques by some of the best sea kayaking instructors, as Jeff Allen and Simon Osborne. He also became a BCU 4 star sea kayaking leader. In March 2015 he applied the knowledge he gained in Cornwall to a demanding expedition. He paddled from Chania(Crete) to Vathy(Ithaca), covering 350 nautical miles in 12,5 days. In October 2018 he attended a BCU sea kayaking coaching course in the Isle of Wight with Owen Burson as his instructor. George has studied Electronic Engineering (BSc) at the Educational Institute of Athens and he did his Masters in Renewable Energy Engineering (MSc) at Heriot Watt University of Edinburgh, Scotland. Certified sailor – Hellenic Offshore Racing Club (HORC). Lifeguard – Greek Lifeguard Academy (ENAK). PADI Scuba Diving instructor (Master Scuba Diver Trainer). EFR – First aid instructor. As an adventure photographer he is trying to provide the paddlers with the best possible shots from their trips. Vaggelis is a passionate local sea kayak guide, running many day-trips each season and some of our multi-day trips. He is an enthusiast sportsperson who has studied at the department of physical education and sport science of the Democritus University of Thrace in Komotini, Greece. His major and dissertation was in adapted techniques in kayaking for people with special needs. In October 2018 he gained the BCU 4 star leader award at the Isle of Wight with Owen Burson as his instructor. The fact which qualified him to work for Odyssey Sea Kayak Club was that he learn how to roll the kayak in only 15 minutes!! In search of improving his kayaking skills he decided to leave Greece for six months and through Erasmus student exchange program he undertook some modules at the University of Dijon in France. He tried many racing kayak training programs and he became a stronger paddler. Vangelis loves being in nature and among his hobbies is wild camping, football, swimming, basketball, volleyball and track and field. He is also an artist and his passion is photography, traditional dancing and he is also a great musician. He used to play the guitar as a member of a traditional music group in Komotini during his studying years. Adriana is from Chile and lives in London but her true summer love is Ithaca! She is an extreme fan of kayaking and Greenland rolling. 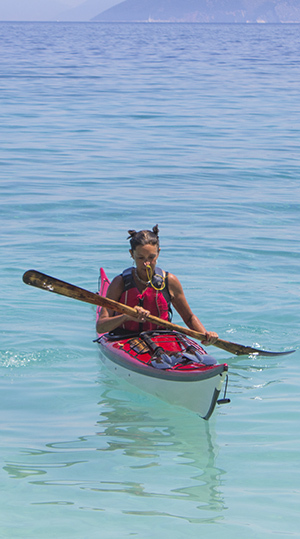 She organizes courses, trips and kayaking expeditions to beautiful and wild parts of the world. She has the BC 3 Star Sea paddler award, holds First Aid, Navigation and kayak coaching qualifications from the British Canoe (ex BCU). She regularly trains with some of the best UK coaches and is currently working towards her BC Sea Leader award. She has organized and coached many groups of paddlers of all levels on trips in the Ionians and Crete, Scotland, Wales, England, Patagonia and Greenland. She is fluent in Spanish, English and French and is learning Greek. At present, she is developing a program for hikers to visit Ithaca and enjoy those breathtaking views from the top of the mountains. Discovering life outdoors happened not so long ago during a multi-day sea kayak trip to the remote glaciers of Patagonia. Prior to that she’d worked as producer in technology and video games holding leading positions at companies such as Sony PlayStation, Lego and Cygames. Discovering the outdoors and focusing her organizational and business skills in establishing a network of paddlers and hikers, enabled her to pivot her life and find a much happier way of spending her time. While she is in Ithaca you can usually find her enjoying a fredo cappuccino at the traditional cafe next to Odyssey Outdoor Activities shop (if she is not paddling her dark red NDK Romany).